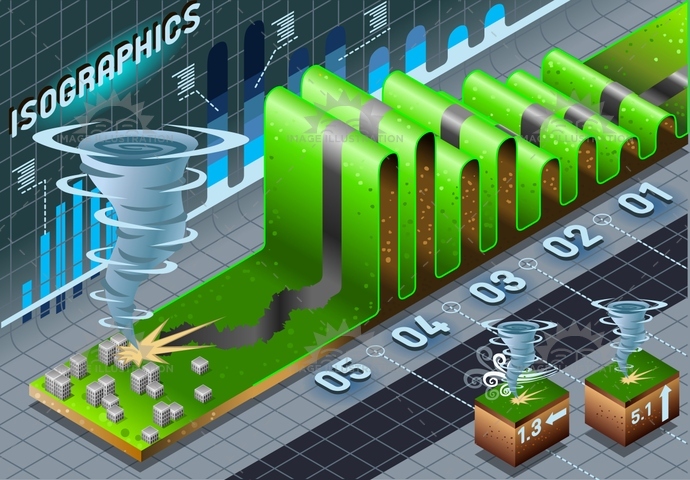 Stock product - detailed vector illustration - Isometric Infographic Collection - Tornado 01 - created by Aurielaki. Image formats EPS AI JPG. SKU: Tornado-01-Infographic-Isometric-AurielAki. Category: Natural Disaster Vector. Tags: aerial, broken, building, business, calamity, city, concept, crack, damage, danger, data, demolition, destroy, destruction, devastation, Diagram, histogram, hurricane, infographic, isometric, nature, report, risk, storm, terrain, tornado, tragedy, Typhoon, wind.